This Friday (Sept. 16) an ethically questionable and totally thrilling fake documentary about the first moon landing premieres in theaters. In the film, titled "Operation avalanche," two CIA agents pose as documentary filmmakers to infiltrate NASA and investigate a Russian mole. Then they stage the 1969 Apollo 11 moon landing. But here's the crazy part: The makers of "Operation Avalanche" say they really did lie to NASA so they could gain access to the Johnson Space Center in Houston, Texas. There, they told NASA that they were filming a real documentary about the moon landing. Instead, the filmmakers created a hilarious but fake documentary about faking the moon landing. 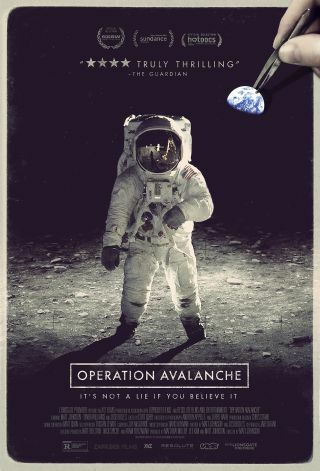 "Operation Avalanche" shows real historical footage from NASA's Apollo days as well as footage of real NASA employees at work. None of them had any idea about the film's true purpose at the time. "We never told them," said Matt Johnson, the director and lead actor. "We invited them to the screening of the movie at the South by Southwest film festival, but no one ever came. "When we were at the Johnson Space Center, it was tough to tell if anyone was onto us, because the run-of-the-mill scientists who worked there didn't care who we were," he continued. "It was mostly our guides and PR people who would ask questions about what the nature of our movie was and that kind of thing. But everyone is so good-natured that it never got to a stage where they were demanding answers." "Operation Avalanche" director Matt Johnson in the mission control room at Johnson Space Center in Houston, Texas. NASA gave the filmmakers access to historical footage and other resources, like the schematics for building a real lunar module. So far, the space agency has yet to complain about the false pretense by which the crew gained access to NASA's grounds. "If they have a sense of humor about it, they're going to love it, because it shows NASA the way that it was in the 1960s," Johnson said. On the other hand, Johnson said he's learned "that NASA doesn't have a great sense of humor about [conspiracy theories about] the moon landing being faked." Johnson said that while may have made a movie about how it could be possible to fake a moon landing, he does not deny that the moon landing happened. "It's a ridiculous conspiracy. But they don't like to engage in mythologizing that conspiracy, however much fun that is."